There were 11.3 million unauthorized immigrants living in the U.S. in March 2013, according to a preliminary Pew Research Center estimate, about the same as the 11.2 million in 2012 and unchanged since 2009. The population had risen briskly for decades before plunging during the Great Recession of 2007 to 2009. 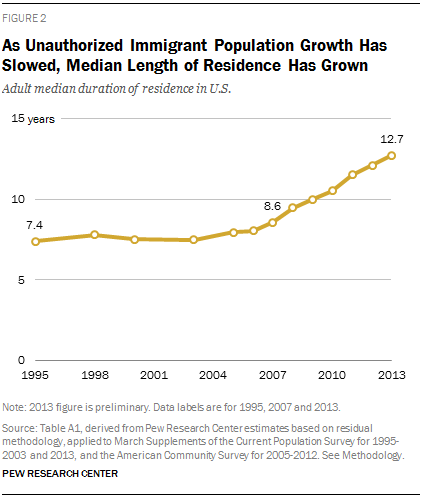 As growth of this group has stalled, there has been a recent sharp rise in the median length of time that unauthorized immigrants have lived in the U.S. In 2013, according to a preliminary estimate, unauthorized immigrant adults had been in the U.S. for a median time of nearly 13 years—meaning that half had been in the country at least that long. A decade earlier, in 2003, the median for adults was less than eight years. There is renewed interest in unauthorized immigrants who are long-time residents of the United States and have U.S.-born children because they are among those to whom President Obama reportedly is considering offering a temporary reprieve from deportation (Los Angeles Times, 2014). Obama reiterated in late August that he would prefer that Congress pass major legislation to overhaul the immigration system, but because Congress has not done so, he may take executive action on his own (White House, 2014). Among the nation’s 10.4 million unauthorized adults, a shrinking share have been in the country for less than five years—15% in 2012, compared with 38% in 2000. A rising share have lived in the U.S. for a decade or more—62% in 2012, compared with 35% in 2000. 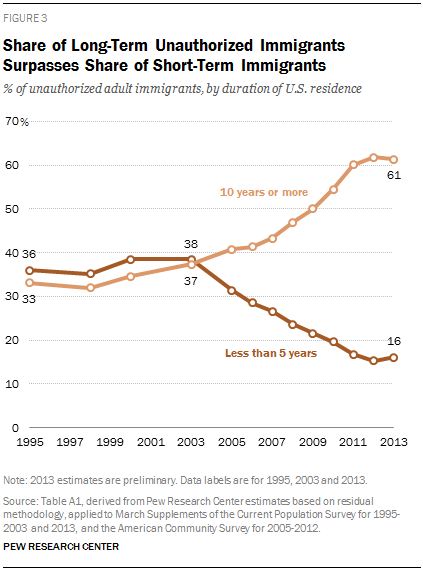 About a fifth (21%) had been in the U.S. for two decades or more as of 2012. As the unauthorized population has tilted more toward long-term residents, these immigrants are more likely to have children who are U.S. citizens because they were born in the U.S. Among unauthorized immigrants, the Pew Research Center estimates that in 2012, 4 million, or 38% of adults, lived with their U.S.-born children, either minors or adults. In 2000, 2.1 million, or 30% of unauthorized adults, did.3 About three-quarters of unauthorized parents residing with their U.S.-born children in 2012—3 million—had lived in the U.S. for 10 years or more. 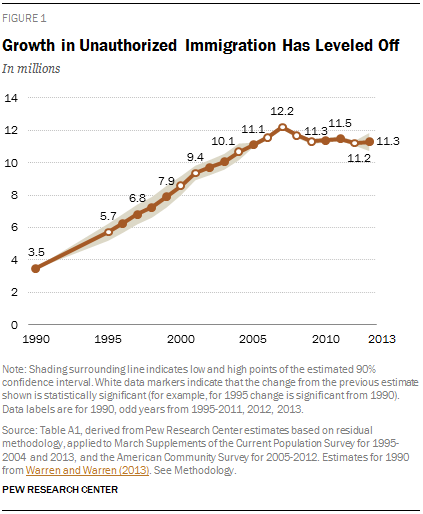 The nation’s estimated unauthorized immigrant population had risen steadily since at least 1990, when it numbered 3.5 million. By 2007, it had more than tripled, to 12.2 million. As the U.S. economy faltered and border enforcement tightened, however, arrivals plummeted, and some unauthorized immigrants, especially Mexicans, have returned home (Passel, Cohn and Gonzalez-Barrera, 2012 & 2013). By 2009, the population fell to 11.3 million, and has changed little since. In 2012, there were 4 million unauthorized immigrant adults living with their U.S.-born children. Among those, 3.7 million do not have protection from deportation under Obama’s Deferred Action for Childhood Arrivals (DACA) program or under the Temporary Protected Status (TPS) program. As the accompanying chart shows, an estimated 675,000 unauthorized immigrants without deportation protection have U.S.-born children ages 18 or older; some of those parents also have younger children.5 The remainder, about 3 million, has only minor U.S.-born children. As of 2012, all unauthorized immigrant parents of U.S.-born children had lived in the U.S. for a median 15 years, longer than the median 12 years for the entire unauthorized population. In 2000, the median was 11 years for these parents. 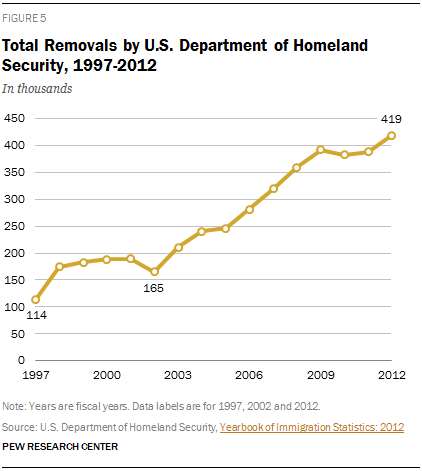 The number of unauthorized immigrant children has declined in recent years, for two reasons. Some unauthorized immigrant children have turned 18 and become adults with unauthorized status. In addition, the recent slowdown in unauthorized immigration overall has resulted in fewer new unauthorized children arriving. The overall 2012 figure for unauthorized immigrants includes about a million people who already have temporary relief from deportation through two separate administrative programs. About 575,000 unauthorized immigrants ages 16 to 30 who were brought to the country by their parents are shielded under Obama’s Deferred Action for Childhood Arrivals (DACA) program (U.S. Department of Homeland Security, 2014). About 400,000 adults and 5,000 children, mainly Central Americans, have “Temporary Protected Status” based on conditions in their home countries that would make it difficult for them to return. Among the 9.6 million unauthorized adults who do not have formal protection from deportation, 16% have lived in the U.S. for less than five years, 60% for at least 10 years, and 20% for 20 years or more, according to Pew Research Center’s estimates. The figures are similar to those for all unauthorized adults. Some have suggested that Obama might expand the scope of the deferred action program that began in 2012, which gave a temporary reprieve and work permits to some unauthorized young adults who were brought to the U.S. by their parents before age 16. Among the possible beneficiaries would be parents or children of those who have received relief from deportation (Washington Post, 2014). According to Pew Research Center estimates, about 450,000 unauthorized immigrants in the U.S. live with their unauthorized immigrant children who are protected from deportation under the deferred action program or who have Temporary Protected Status. Of these adults, more than half—about 230,000—also live with at least one of their U.S.-born children. A relatively small group of unauthorized immigrants, both children and adults, lives with parents who are protected from deportation under the deferred action program or who have Temporary Protected Status. According to the center’s estimates, this group numbers about 50,000. Obama signaled in March that he would consider changes in immigration policy via executive action, under renewed criticism by immigrant advocates for a record number of deportations during his administration (New York Times, 2014). From 2009 to 2012, a record 400,000 immigrants were deported per year, an annual average higher than under the administration of his predecessor, George W. Bush (Gonzalez-Barrera, 2014). The president had said in June that he would pursue changes in immigration policy on his own by the end of summer after Congress failed to pass major legislation, but in late August he signaled that deadline might slip (White House, 2014). The debate over immigration policy has been complicated by the recent arrival of thousands of unaccompanied children. During the first 11 months of the 2014 fiscal year (Oct. 1, 2013-Aug. 31, 2014), the number of unaccompanied children caught at the U.S.-Mexico border rose 88% compared with the same period in fiscal 2013 (U.S. Customs and Border Patrol, 2014). The Pew Research Center has not tested public opinion on the idea of broadened temporary relief from deportation for some categories of unauthorized immigrants. In a survey earlier this year, Americans were evenly divided over whether the growing number of deportations was a good thing or a bad thing, with 45% saying each (Pew Research Center, 2014a). But in a new Pew Research Center survey, the share prioritizing tougher border security and law enforcement has risen since early in Obama’s second term (Pew Research Center, 2014c). The national survey, conducted Aug, 20-24 among 1,501 adults, finds that 41% say that in dealing with unauthorized immigration, national policy should give equal priority to better border security and to creating a path to citizenship for unauthorized immigrants already in the U.S. A third (33%) say the priority should be on better border security and tougher law enforcement; 23% say that a path to citizenship should be the policy priority. In a 2013 survey, the public was evenly split over whether national immigration policy should prioritize better border security or creating a path to citizenship (25% for each). Nearly half (47%) said both should have equal priority (Pew Research Center, 2013). Most Americans still support a path to legal status for unauthorized immigrants. By 68% to 30%, the public in July backed offering unauthorized immigrants an opportunity to gain legal status (though not necessarily citizenship) if they meet certain requirements, though support has declined some since February, according to a recent Pew Research Center survey (Pew Research Center, 2014b). Pew Research Center surveys have found that a strong majority of Hispanics and Asian Americans want to see immigration reform passed and support creating a pathway to citizenship for unauthorized immigrants. However, both Hispanics and Asian Americans believe it is more important for unauthorized immigrants to get relief from the threat of deportation (Lopez, Taylor, Funk and Gonzalez-Barrera, 2013). This report provides preliminary estimates of the size and duration of U.S. residence of the 2013 unauthorized immigrant population for the nation. It also includes 2012 and earlier estimates of the unauthorized immigrant population, its duration of U.S. residence, and number who live with U.S. citizen children. The estimates use the “residual method,” a widely accepted and well-developed technique based on official government data. The data come mainly from the American Community Survey and March Supplement to the Current Population Survey, conducted by the U.S. Census Bureau. For more detail, see the Methodology appendix. This report is a collaborative effort based on the input and analysis of the following people on the staff of the Pew Research Center. Editorial guidance was provided by Mark Hugo Lopez, director of Hispanic research. This report was written by Jeffrey S. Passel, senior demographer; D’Vera Cohn, senior writer; Jens Manuel Krogstad, writer/editor; and Ana Gonzalez-Barrera, research associate. Gonzalez-Barrera also created the charts; number-checking was done by Anna Brown, research assistant. Eileen Patten, research analyst, assisted with formatting and production. Molly Rohal was the copy editor. Find related reports online at pewresearch.org/hispanic. “Foreign born” refers to an individual who is not a U.S. citizen at birth or who, in other words, is born outside the U.S., Puerto Rico or other U.S. territories and whose parents are not U.S. citizens. The terms “foreign born” and “immigrant” are used interchangeably. “U.S. born” refers to an individual who is a U.S. citizen at birth, including people born in the United States, Puerto Rico or other U.S. territories, as well as those born elsewhere to parents who are U.S. citizens. When referring to children of unauthorized immigrants, the terms “U.S. born” and “U.S. citizen” are used interchangeably; a small number of these children may be naturalized citizens. The “legal immigrant” population is defined as people granted legal permanent residence; those granted asylum; people admitted as refugees; and people admitted under a set of specific authorized temporary statuses for longer-term residence and work. This group includes “naturalized citizens,” legal immigrants who have become U.S. citizens through naturalization; “legal permanent resident aliens” who have been granted permission to stay indefinitely in the U.S. as permanent residents, asylees or refugees; and “legal temporary migrants” who are allowed to live and, in some cases, work in the U.S. for specific periods of time (usually longer than one year).